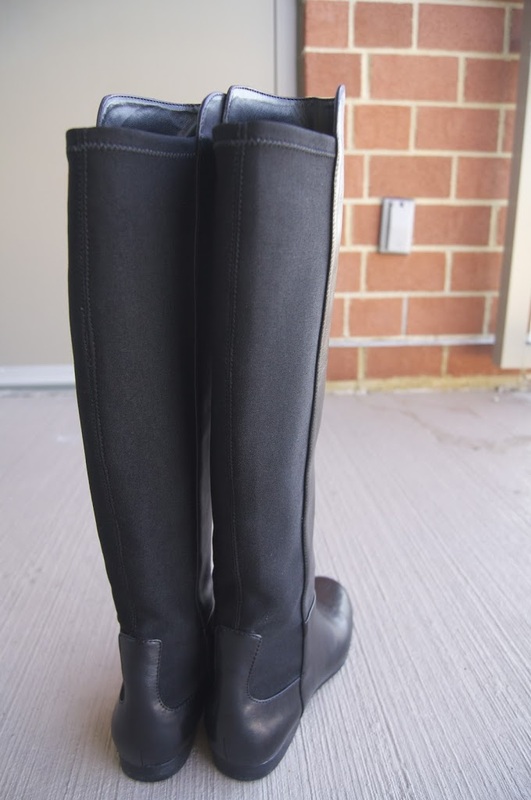 I’m always on the hunt for a good fitting black knee-high boot that is appropriate for work and doesn’t look like a classic riding boot (not really my style). 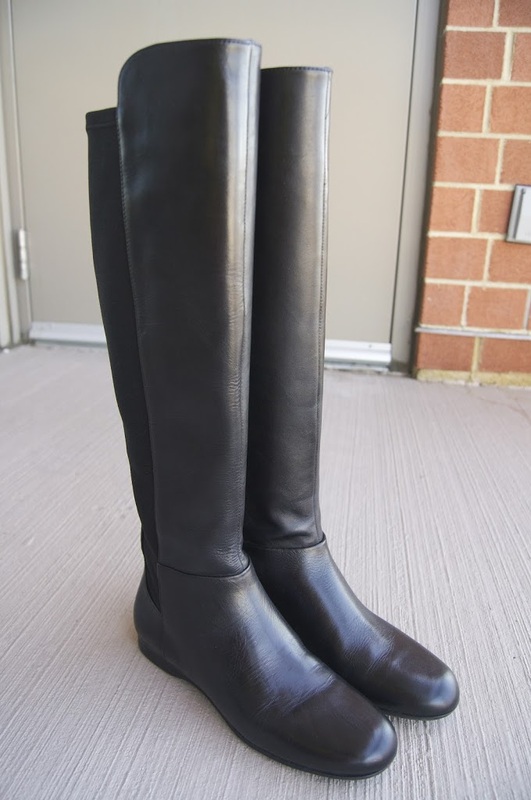 If you have small calves like I do, you know that it is definitely a challenge to find an affordable tall boot without having to take it to a cobbler to have them altered to fit (which in itself isn’t cheap either). I came across these Enzo Anglioni Zeric boots on sale. Many reviews mentioned how small the calf circumference was, but had different opinions as to the fit on the ankle. Some women described it as very boxy and ill-fitting and while others say it fits just fine. My guess is that the fit on the ankle depends on the overall fit on the calf, which of course varies person-to-person. That being the case, I had to try these for myself to see if they might fit. The back of the boot is elastic, much like the now-seemingly classic Stuart Weitzman 50/50 boot (if IIRC, I spotted them on Lindsay Lohan back in 2006 and they are still selling like hotcakes every fall/winter season since). Of course, I was not expecting that the leather be as buttery soft for just $100. As I mentioned, one of the biggest complaints about this boot was the “boxy” ankle. According to many reviews, the ankle area just didn’t “mold” with the ankle very well making it look very wide. I didn’t find this too be super-problematic. This could partly be a result of the shape of the ankle partnered with the design of the boot, but IMO, I think another big reason for the boxy ankle look has to do with the stiffness of the leather. 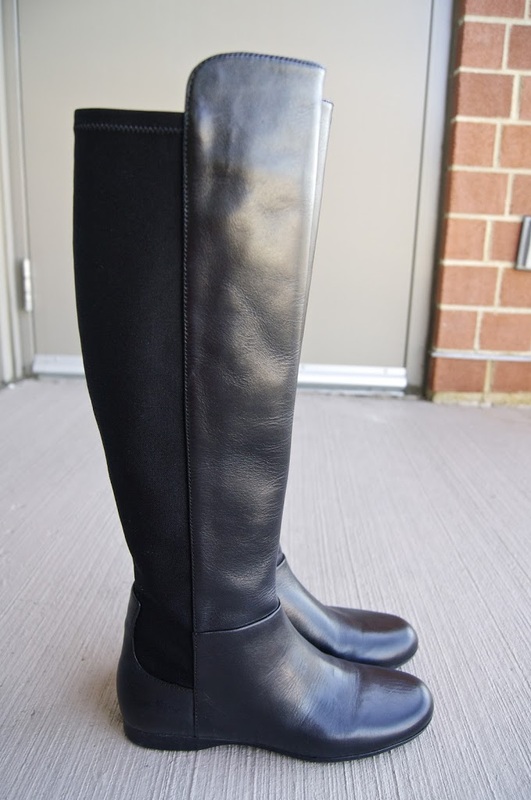 The leather Stuart Weitzman 50/50 boots are so soft that they just flop over. These boots, as you can see in the photos, can stand straight up on their own. But I think once the leather on these are broken, the ankle area won’t be so stiff and the boxy ankle look won’t be that much of an issue. You’d have to be willing to take that risk, however. I haven’t decided if I will yet. Quality: As I mentioned, for $100, I wasn’t going to expect much. The leather isn’t half as nice or soft as Stuart Weitzman $600 boots, but the construction seems pretty good. 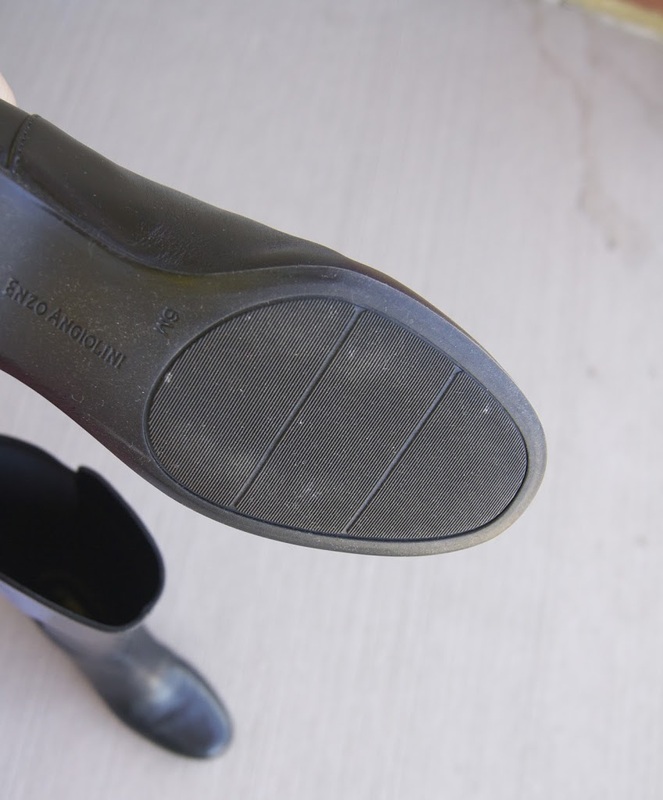 It has a rubber sole for traction, so you don’t have to worry about zipsoling a leather sole. 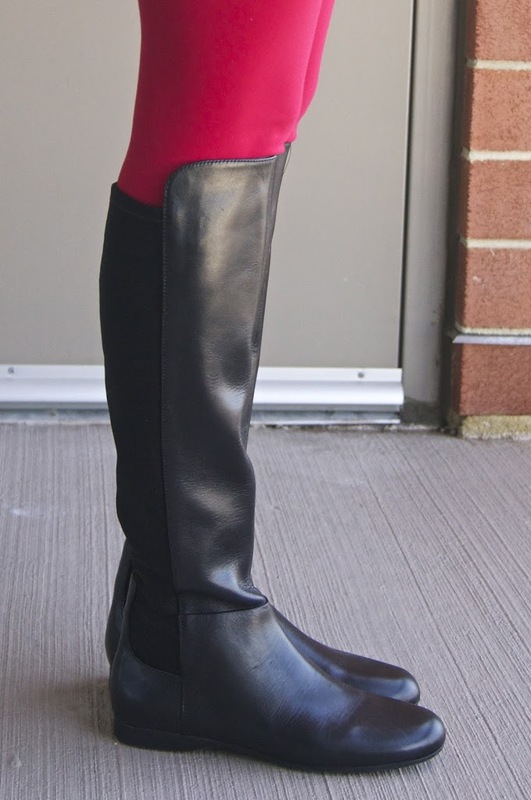 The elastic in the back seems a bit cheap-looking, but for a knee-high boot that fits, I would be willing to overlook it. 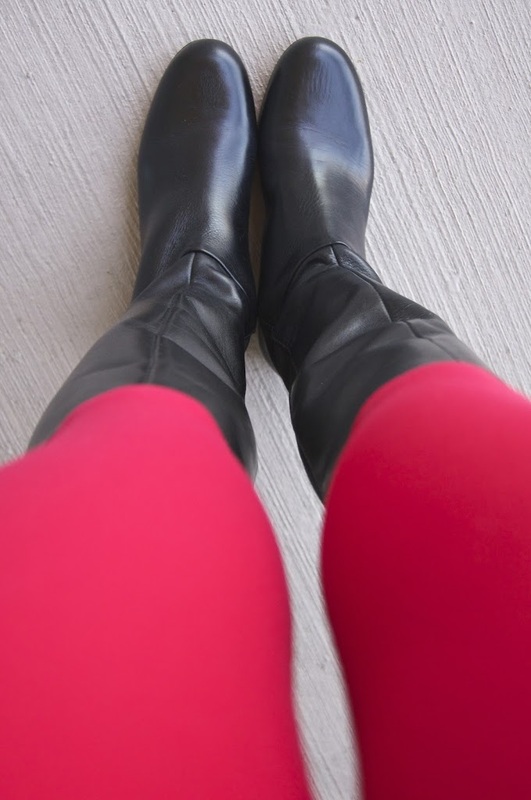 Comfort/fit: For boots, I go back and forth between a size 6 and a 6.5. I sometimes purchase 6.5 to accomodate thick socks and a winter insole, but length-wise, these run a bit long. I feel like with the size 6, I still have a bit of extra room. However, they do run narrrow. The feel pretty snug around the sides of my feet, which I’m sure will break in after a few wears. But if you have wider feet, you might want to consider going up half a size to avoid pinching and adding an insole. The inner sole seems comfortable and a good choice for all day walking (or simply trudging around in snow), but I do feel a bit of rubbing against my ankles when I don’t have socks or a long pants covering my skin. That is a common problem for me though, so I wouldn’t hold it against this boot. Verdict: I thought for sure I was going to send these back, but I’m considering grabbing a bottle of leather conditioner and trying to break these in in hopes that they fit better. 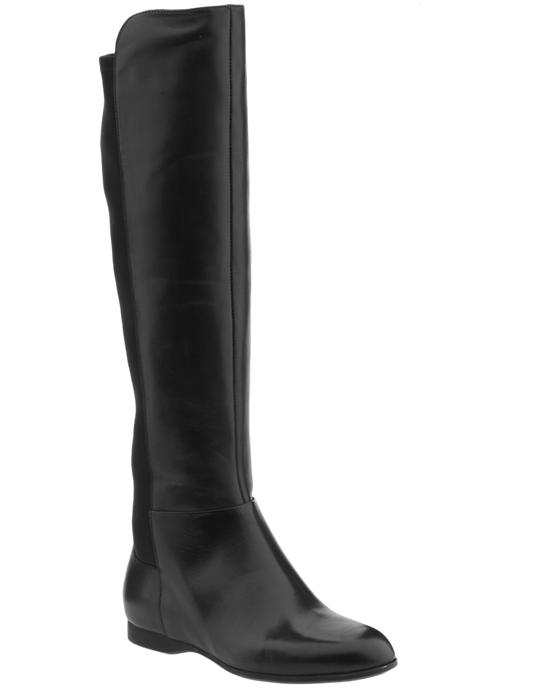 I’m in need of a knee-high boot that is work appropriate, and these just might fit the bill until I can invest into some more expensive pairs. It comes in both black and brown and you can get them on sale for $79.50 at Piperlime right now. I decided to be a little cheezy for Single’s Awareness Day/Valentine’s Day by wearing my heart print blouse. But to not make it so obvious, I threw on my blue cardigan over top. LOL. I wonder if anyone noticed the heart pattern? I almost didn’t post this outfit. Things are kind of crazy right now; there are a lot of things happening at once career-wise and I’m trying to sort it out as much as I can without stressing, but I’m feeling the pressure–all of which I have placed on myself, of course. I feel like things are finally starting move, but hopefully it’s just not another tease because I felt like this about the same time last year and that didn’t work out so well. =/ I’m crossing my fingers that this will have an opposite outcome. 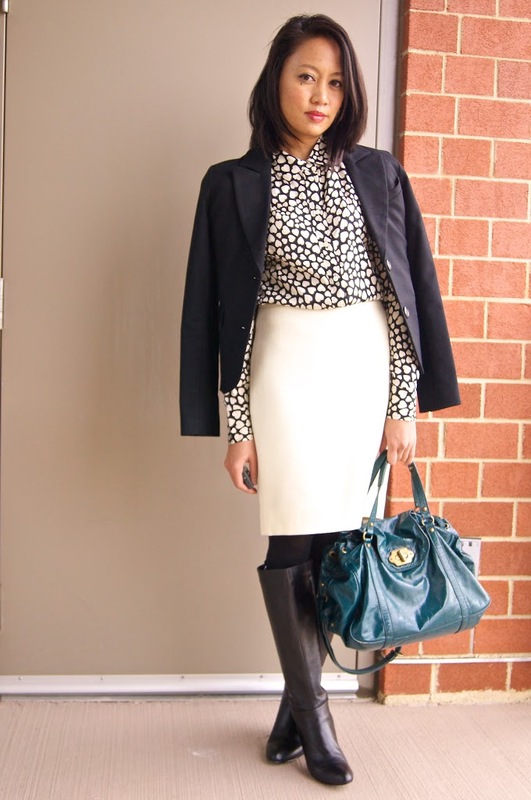 However, as a result of all this craziness, blog outfits might be a bit more infrequent the next few weeks. On a more positive note, I have a few upcoming blog-related surprises for all of you, so stay tuned! Plus, I’m going to be making my first trip to NYC next week! Any suggestions on places to check out? ?